At a cost of $60,000, the three-story wooden Hazard’s Pavilion opened with the Flower Festival of 1887. The big barn was named for Henry T. Hazard, soon to be mayor of Los Angeles, and had most recently been the site of a cattle corral used by Platt’s Dairy. Hazard’s was sort of a town hall where about anything could go on, and usually did. 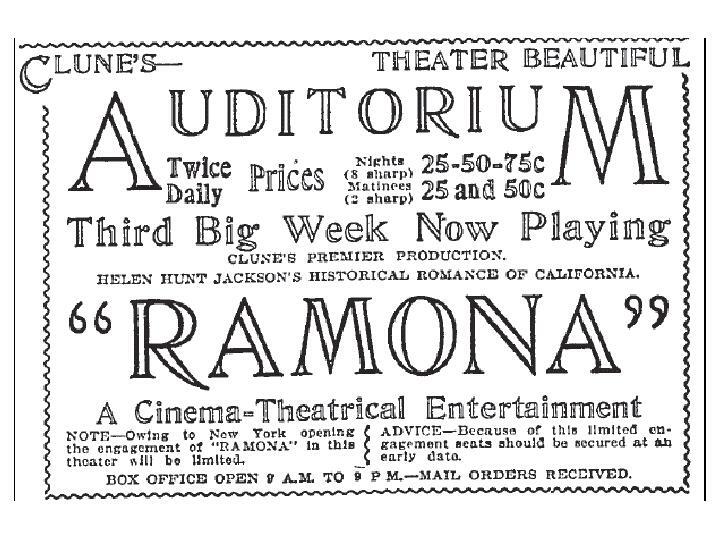 Upon the pavilion’s demolition in the late spring of 1905, the Los Angeles Times looked back wistfully on the barn’s events, which included “citrus fairs, flower festivals, political conventions, temperance rallies, revival meetings, poultry, dog and Belgian hare shows, cake walks, sparring exhibitions, mass meetings and educational gatherings”. Enrico Caruso, President Benjamin Harrison, Booker T. Washington, William Jennings Bryan, Carrie Nation, and Thomas Nast all spoke at Hazards’ Pavilion. Wait. As much as I’d like this post to be about Hazard’s Pavilion, the designated landmark is the succeeding Philharmonic Auditorium. Onward. 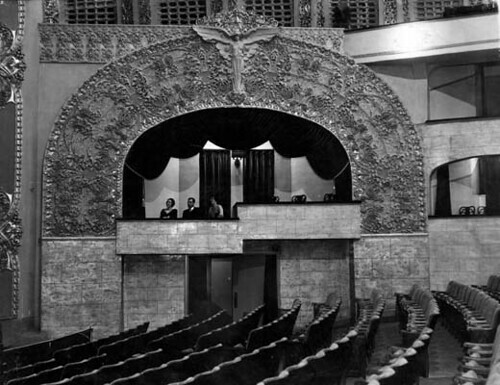 In May of 1905, the Temple Auditorium Company adopted the Spanish Renaissance/Moorish Revival design by Charles F. Whittlesey and Otto H. Neher (Whittlesey next pops up on the HCM list at No. 286, the Mayflower Hotel, Neher at No. 396 with the Federal Bank Building). 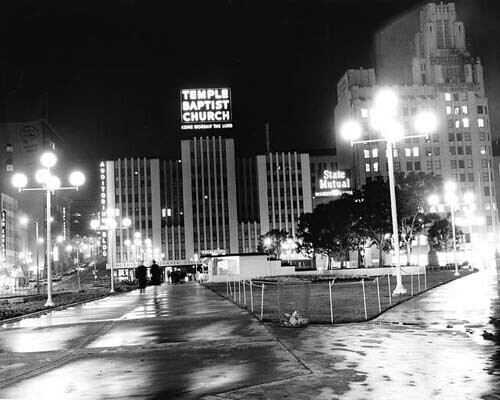 The six-story building, funded by the Temple Baptist Church and some neighborhood businessmen, would be the first large reinforced concrete structure in Los Angeles and the biggest theatre west of Chicago. It would also be recognized as the first large space to have a balcony without supporting columns. That black fuzz in the middle of the right side was Central Park, now Pershing Square. The picture was taken, by my best estimate, on 3/28/06, give or take a day. 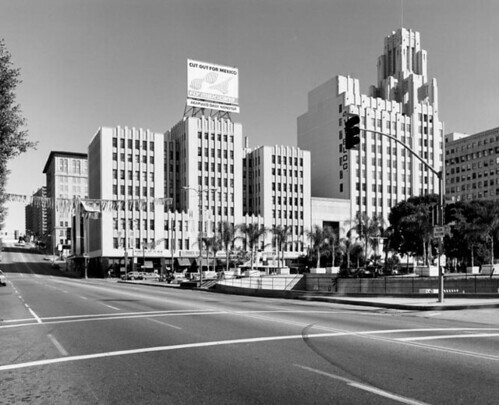 Prior to construction of the building, an L.A. Times article reported the approximated cost would be $350,000. There would be retail space on the Fifth Street side, a basement with a 1,000-seat banquet hall, and two halls on second floor, “Choral Hall” and “Berean Hall”, each with a seating capacity of 950. The floors above these halls would house 118 offices or studios. Finally, the plan was to have the main auditorium seat 5,000. 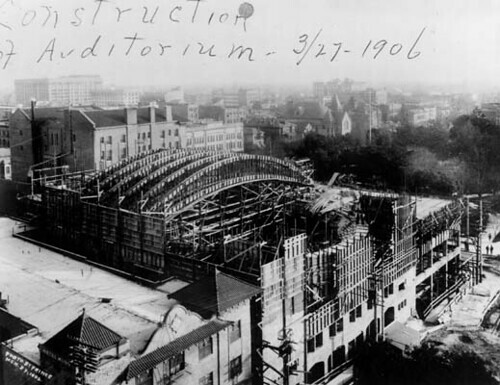 The one-year-old Los Angeles Philharmonic moved from its home at Trinity Auditorium to the Fifth and Olive building in 1920. Artur Rodzinski was the conductor. I hope the orchestra played to more than the three theatre-goers in the picture below. 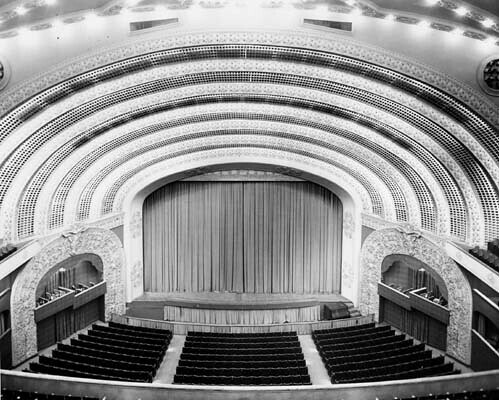 In March of 1938, just a few years after a $50,000 improvement to the auditorium, C.H. Brain, general manager of the Auditorium Company, Inc., controllers of the site, announced the 22-year-old building had become outmoded, necessitating a $200,000 redesign by architect Claud Beelman (Beelman's all over the list of L.A. landmarks). The mansard roof was removed and the top story(s) extended. The auditorium’s main entrance was moved to the Olive Street side of the now Moderne building. Twenty-eight years later, the opening of the Music Center would render the Philharmonic Auditorium obsolete. The auditorium saw its last performance by the L.A. Philharmonic during a matinee on April 10, 1964. While religious services continued there for another fourteen years (during which time it was known as the Temple Baptist Church), the building was finally razed in the early April, 1985. It doesn’t seem there was a large outcry to save the nearly 80-year-old structure. The plan, twenty-two years ago, was to build a 35-story hotel and office building complex. Oh. The Philharmonic Auditorium also served as home to the Los Angeles Light Opera Company for 27 seasons. Well, the site’s still a parking lot. However, if you have an eye for subtlety, you’ll notice there are plans for an 850-foot “ultimate urban residence in the sky” on the lot. The “tallest residential tower west of Chicago and among the ten tallest in the world”, in fact. Fine. I hope someday to check out the view from the top. 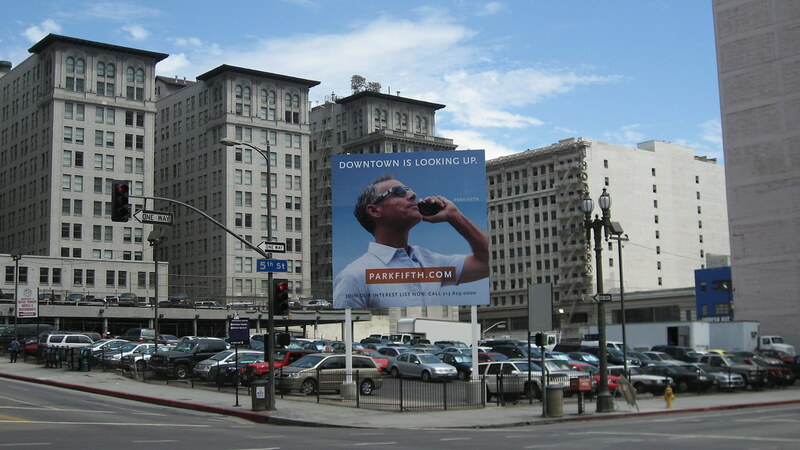 Unfortunately, that billboard guy with the shades and cell phone probably wants to hang out with me as little as I do with him. The black and white pictures are from the Los Angeles Public Library photo collection. And in 1913, the coveted title of biggest theater west of Chicago was snatched away by Adolph Ramish's Hippodrome-- 3000 seats, every one a dime, and a stage big and tough enough to host opening act Toddles the elephant! The Hip (320 South Main) became a parking lot in 1952. I suspect enough vice-related activity went on at the Hippodrome to warrant a mention on Saturday's Esotouric tour, no? 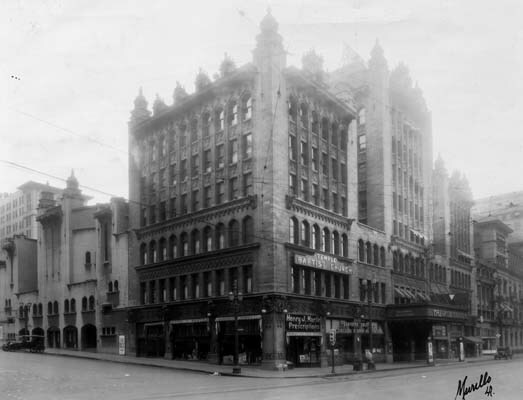 From roughly 1915-1920, the theater was leased by Billy Clune and called both Clune's Auditorium and Clune's Theater Beautiful. If you squint, you can make out the "Clune's" on the marquee in this shot. Thanks again for such a fantastic resource! Thanks for the compliment, Christina. Right back at you for your On Bunker Hill work. Do you happen to know where I might be able to find any more information about the architect, Charles F. Whittlesey? I am hoping to find an archive of his work, if possible. Thanks! Hi, Morgan. Have you tried his page at the Pacific Coast Architecture Database? Is this not the building that was also the home of Norman Granz famous Jazz at the Philharmonic Series? This could be the building's greatest artistic legacy. Before it was demolished I was involved in theater productions that used the stage as a rehearsal space. The Austin organ in the auditorium was the largest on the West Coast when it was installed in 1910. However, because of the state of organbuilding at the time, it was of limited use, due to its orchestral nature, with voices all at unison pitch and a very poor, if loud, chorus. Some ranks were scavenged by builders such as Rosales (who converted the 32' pedal reed into one of his "car horn" reeds in another organ), while David Junchen used individual pipes from the flues as "tchachkes" given away to large donors of his "mega Moller" project then going into the Pasadena Civic. I played this organ many times, and its usefulness as a "concert" organ was nearly nil, as it could not play the bulk of literature written for organ, save for orchestral transcriptions and, of course, 19th century hymns. Another observation...it's a "big orange landmark" because the bulk of the interior, when the building went down, was painted an odd orange color. It was plainly visible as the building was demolished in 1986. I worked across the street at the time. It was a shame to see it go, but the building was quite obsolete, and Temple Baptist's congregation had all but evaporated by that time. Hazard's Pavilion was the first venue where Uncle Tom McCarey, the first great boxing promoter in Los Angeles, staged his first shows during a period from 1901 to 1904. 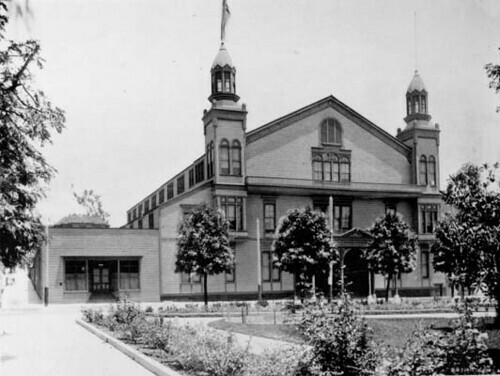 McCarey also staged boxing shows at the Naud Junction Pavilion from 1905 to 1911 and in Vernon from 1910 to 1914. He had two sons who went on to become movie directors. Leo was one of the great movie directors of his era while Ray was regarded as more of a journeyman. You were fortunate to have played one of the biggest early Austins. There were few concert organs of that scope, and fewer have survived. As for it's orchestral nature, that was the point. These organs were designed for transcriptions, tone poems, and painting with sounds. Realistically, no one pipe organ can play the bulk of organ literature in an authentic fashion. So rather than bemoaning that Bach doesn't sound "correct" on it, why not pull up Reger and Karg-Elert? "In 1866 Captain Ariel Merrick Hazard (1797-1873) and his son-in-law, Harley A Taft purchased the remote, rural block bounded by 5th, Hill, 4th and Olive for $9.80 at an obviously-not-terribly-well-attended tax sale. The final price may have been closer to $30 after fees and "advertising" were figured in. Capt Hazard (originally from Vermont), his wife, Eleanor, and children, including Mary Eleanor (1841-1933) George Washington (1842-1914) and Henry Thomas (1844-1921) had come to Los Angeles in 1854 by covered wagon from Michigan. Harley Taft (1826-1906) arrived from R.I. traveling around the Horn. Mary E Hazard and Harley Taft were married in LA in 1856. Harley and Mary built a home on 5th St near Hill, facing the Park and raised a family. Desperate for neighbors they offered free house lots along the Olive St side of the block. There were no takers." Actually before Hazard built his Pavilion, he had sold the corner to George Lehman of Roundhouse fame, who planned a huge venue where Angelenos could gather for entertainment. Lehman went bankrupt before he could do anything and the land reverted to Hazard who realized Lehman's dream.